Winter is a season that Bangladeshi people celebrate through some special festivals of which Pous Mela is the most familiar. Students of Jahangirnagar University organise a winter festival every year to mark the speciality of the season. They try to put forward overall folk culture of the country through the winter festival. The folk culture of Bangladesh, basically, elucidates the image of the rural society and still, majority population lives in rural areas. The rural culture resonates in every Bangladeshi’s heart. Despite the present trends of urbanization and globalization, the underlying culture, in both urban and rural communities is folk oriented. The folk games e.g., bali khela, boat race, bauchhi, dariyabandha, gollachhut, nunta, chikka, dangguli, solaghunti, mogal-pathan, ekkadokka, baurani, kadikhela, ghuntikhela, kanamachhi, kite flying, pigeon flying, cockfight and bullfight, are a part of the total culture of Bangladesh and people enjoy it in different occasions. It is a matter of grief that the folk culture of Bangladesh is slowly disappearing and confining it into some occasions because of cultural commoditization, we have an enriched culture though. 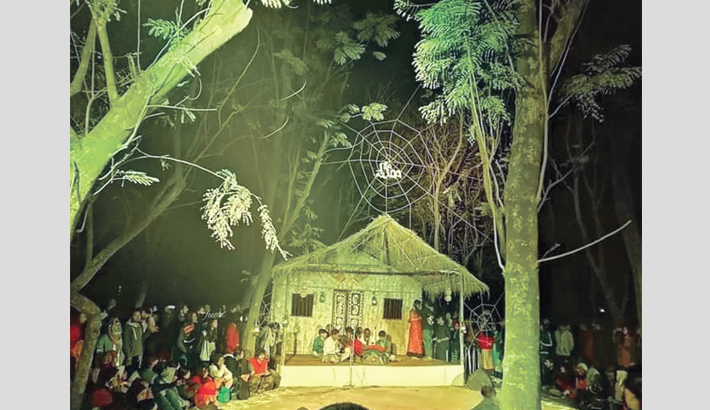 To address this issue and prevent aggression of commercialization, a group of students from Jahangirnagar University (JU) has recently organised a winter festival titled ‘Him Utshob’ in the continuity of the previous years. The student group of the university organised the winter festival back in 2015 for the first time on the university campus. This year the three-day long winter festival was held from January 17-19 with the slogan ‘Su ashay kete jak ku ashar ghor’. The programme was observed amid much festivity, featuring a good number of folk events including classical music presentations, indigenous dance, snake charming, lathi khela, and folk concerts. The mesmerizing programme attracted students and local people as well. The beginning day of the festival was featured with Him Yatra (Winter Possession), Snake Charming, Lathi Khela, Indigenous dance (Monipuri), Jokers performance, Folk Song (Gazir gaan), painting and photography exhibitions. “This is the first time I am watching the snake charming. It seems to me that I am dreaming”, said Zariya Tabassum, a student of level-4 of an English medium school. The second day of the winter festival was featured with an art camp, poetry recitation and classical music presentations. “The programme featured a good number of folk events. It was an overwhelming festival indeed”, said Humayun Iqbal, who is a government official and a fan of folk songs. He suggested introducing some events such as yatra, baul, gambhira, etc which are presented through singing, dancing, and play-acting. He also desired to listening khemta songs and ghatu songs in the next year’s event. On January 19, the closing day of the festival, Bangladeshi rock band Bangla Five released their debut album ‘Confusion’ and a folk concert also staged at Cafeteria premises on the university campus where different local mainstream and folk bands took part. The winter festival of this year was dedicated to legendary rock singer Ayub Bachchu who passed away in 2018. “I have come here from Rajshahi to enjoy this winter festival. The whole event was so much enthralling and I was present at each and every night while the festival was ongoing”, said Kazi Rafiq, a student of Rajshahi University. Thousands of student from different universities and people from different districts across the country gathered on Jahangirnagar University campus to enjoy the unique programme. Tasbibul Gani Niloy, one of the organisers, thanked all who joined the event and vowed to make it more eventful next year. He said, “We are happy to see that our efforts made other happy. I think it is a big achievement for our team that we have completed the festival successfully. We will feature more folk events next year”.